NOTE: The following article details a home cooking experiment. It is not intended to insure the the safety of anyone who tries it home. 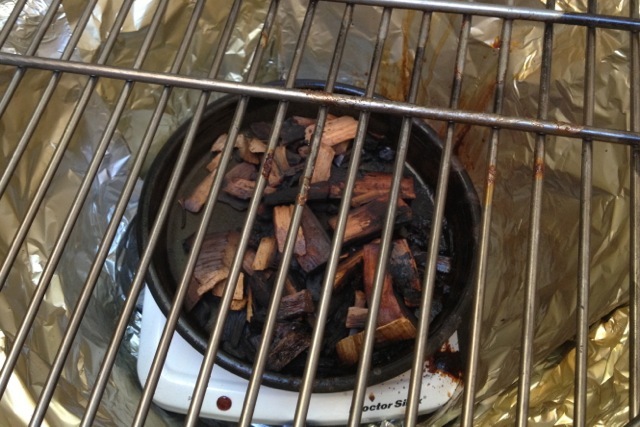 To be sure your DIY Smoker is safe, you may want to have it inspected by Fire and Food Safety Professionals. This project is not recommend for those under 18, without parental supervision. 9/9/13- A big thanks to Marc Farris, Producer of the BBQ channel on YouTube. Thanks to his tip, we researched the latest FDA Guidelines on Terra Cotta. Until more testing is done, we do not recommend you do this at home. Otherwise, hope you enjoy reading about our little experiment. 11 Hour Smoked Pulled Pork Sandwich with Grilled Cabbage Broccoli Coleslaw. Smoked POWER Chips. 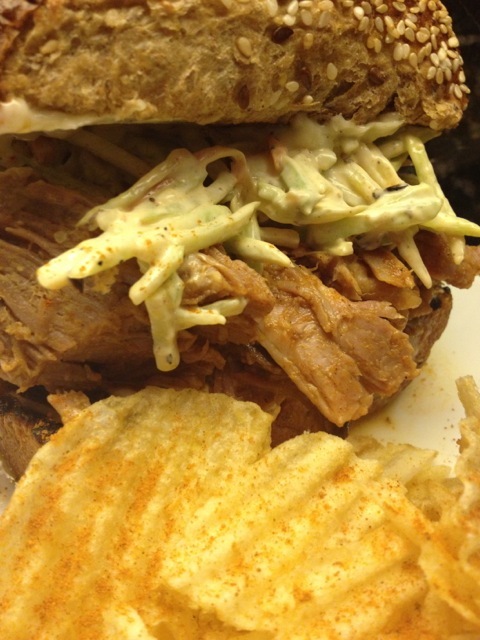 You love the smoky flavor of Pulled Pork, but are tired of the long lines at the local BBQ Stop? The wait is over. You can build your own Electric Ceramic BBQ Pot Smoker at home. It is fast, easy, environmentally friendly and affordable. The commercial Ceramic Giant Egg can easily cost more than $1000, with all the accessories. Even Lady Gaga could have trouble affording one. 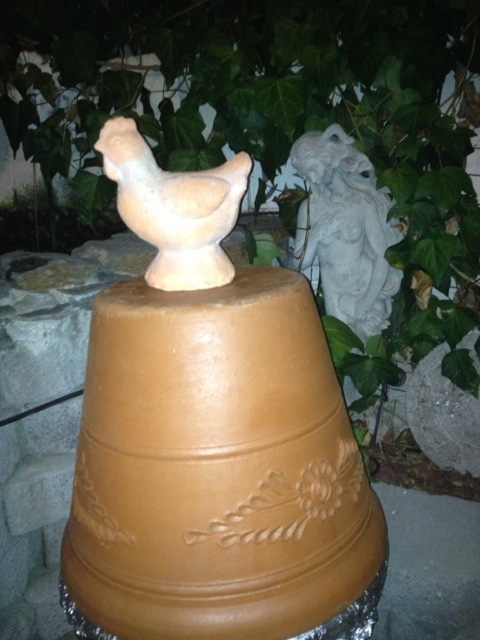 TasteeBQ was recently inspired by vintage 2007-2008 Alton Brown videos which made Ceramic Flower Pot Smokers for $50. Now, he hopes to take you to the next level. Which comes in first- the Chicken or the Egg? 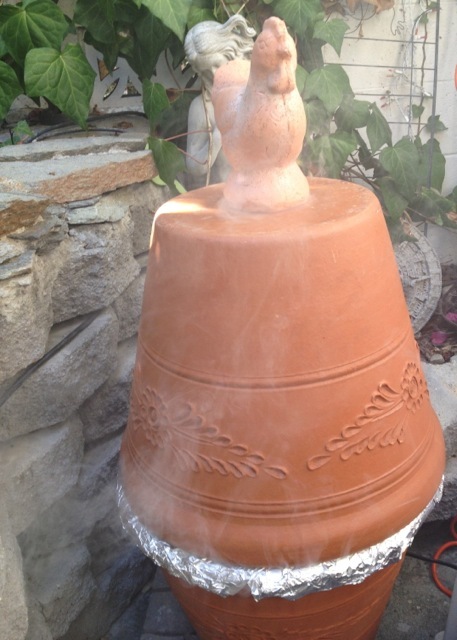 Homemade Ceramic BBQ Pot Smoker. Venus seems to approve. The concept of using plain Terra Cotta pots didn’t seem so appealing to TasteeBQ. He needed something that could be presentable on the front patio next to his cherished Venus Di Milo. So TasteeBQ set a budget of $100 to see if he could build a Smoker with a little more visual appeal. In the end, he only spent $77.38 (tax not included) to build an environmentally friendly Electric Ceramic BBQ Pot Smoker, which uses less Wood and little to no Charcoal. Also, no Propane Gas or Lighting Fluid required. Here you see set up. 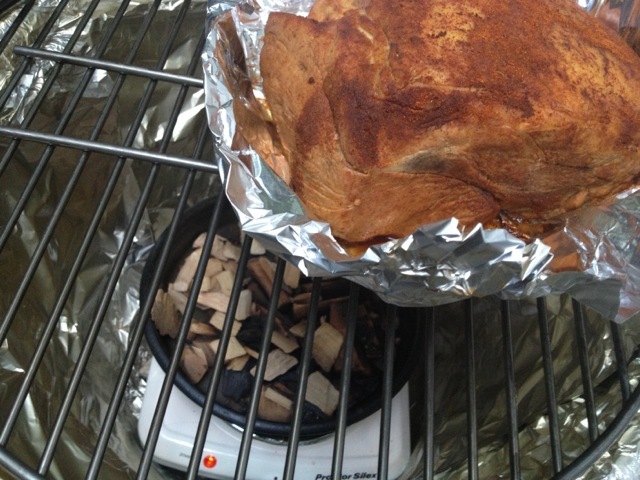 Burner is sitting on layer of Rocks, then Wood Chip Tray, Grate and your POWER Rubbed Meat. 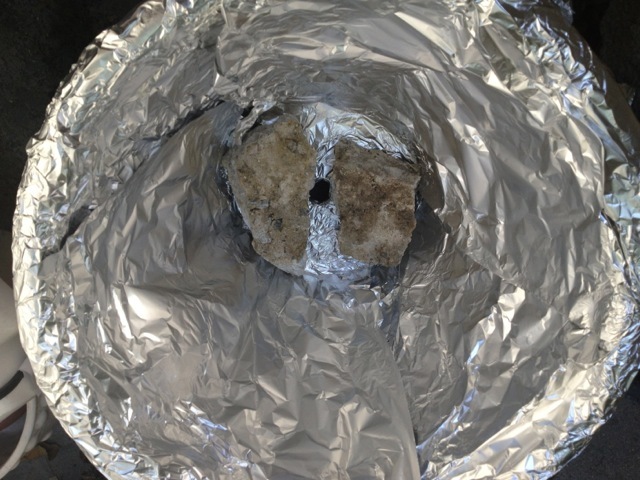 We lined inside of Pot with Foil for easier clean up. “Midnight in the Garden of Good and Enticing.” Meat has been smoking for 8 Hours. Smell of Pork is Amazing. Still has 3 Hours to go. EASY 5-STEP SET UP takes less than 1 Hour. Of course, it is good to check that everything fits before doing final assembly. 1. 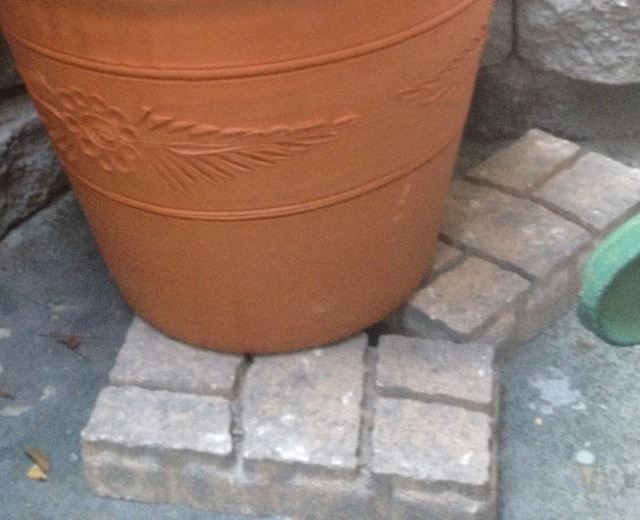 Set Pot on Base Bricks in steady position, leave gap to run Cord through. Make sure Pot is steady on Bricks, leaving room for Cord to wind through. 2. 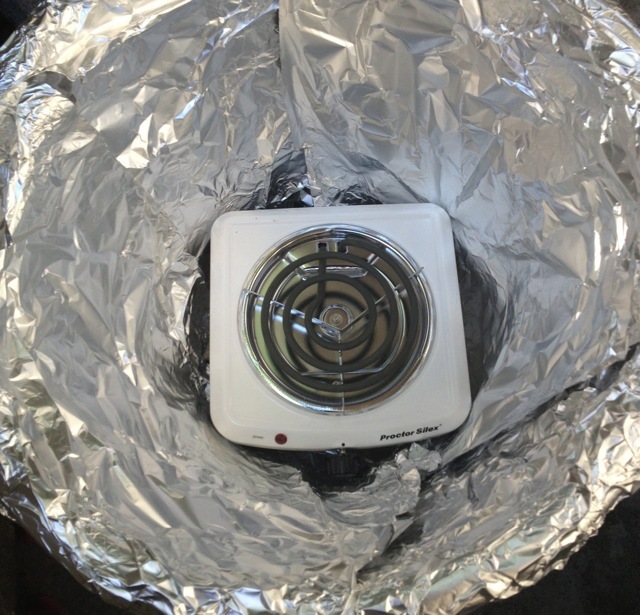 Line Bottom Pot with Aluminum Foil. Then place level Holding Bricks at bottom inside Pot. Smooth Bricks would probably work better, assuming they are at proper height for holding Burner. These odd ones did the job for now. Make sure they are cleaned. 3. Set Burner on top of Bricks. Position Control Knob in open spot where it can be reached. Run Cord through bottom hole. Outdoor extension Cord may be needed to reach nearest outlet. Be sure connection is at safe/dry location. Burner is set level. Check that there is space to reach Control Knob. We were a little concerned plastic Knob would melt. So far it seems to be heat resistant. Plus temps will probably never go over mid-200 degrees range. 4. Place Metal Pan with Wood Chips on top of Burner Coil. An old Chicago Deep Dish Pizza Pan was re-purposed as Wood Chip Tray. Though centered, we cheated it away a little for Knob access. Also experimented with variety of Mesquite and Hickory Chips and Chunks. 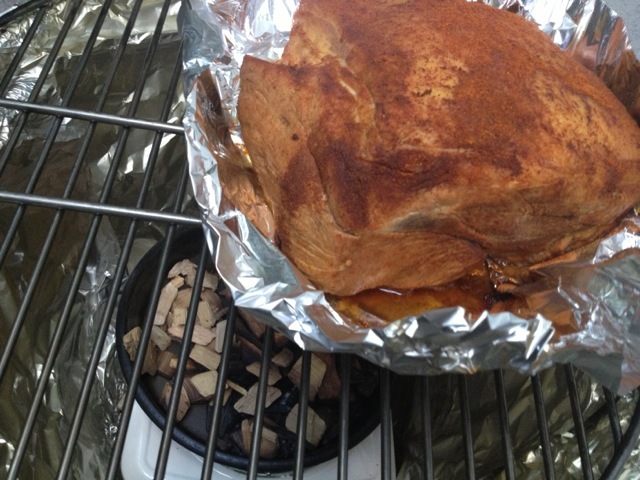 We found that the Chips eventually smoked, while the Chunks provided more of a smokeless incense while cooking the Pork. 5. Place Grate on Top of Bottom Pot. Now you are ready to get Smoking. First time starting it up, we checked that Burner was working before adding Meat. The Burner had to be turned up to Max to make Wood Chips smoke and heat entire oven. The Chicken supervises as assembly is completed. Try to find a store that has a good selection of (both) Flower Pots and BBQ Grates. Otherwise, it is best to take Grate with you to find the right Pot. Can’t tell you how many combinations we had to try before finding the right fit. 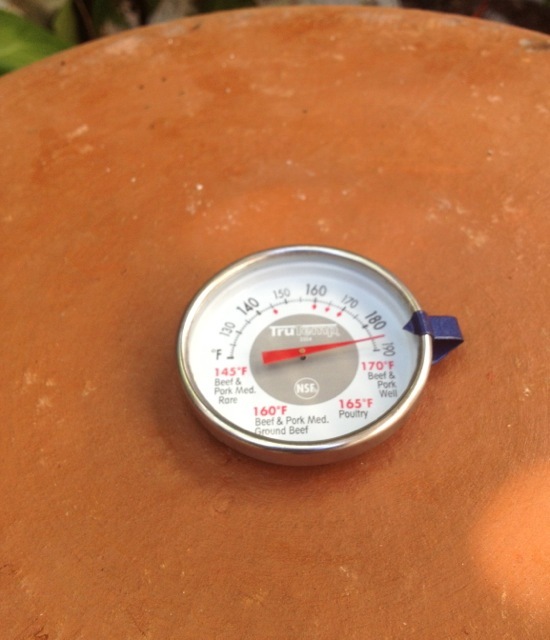 We used the Terra Cotta Chicken to cover top hole and hold in the heat. Once it started to smoke, we placed Meat Thermometer in top hole until it topped 190 degrees, so we knew we had a hot Oven. Not gonna lie. It felt amazing to see Pots smoking for the first time. And watching the Temperature Gauge rise over the top. – Smoker is electric and environmentally friendly. We only had to replace Wood Chips once, at the beginning (to get sufficient amount). After that, it did aromatic wood cooking with very little actual clouds of smoke. 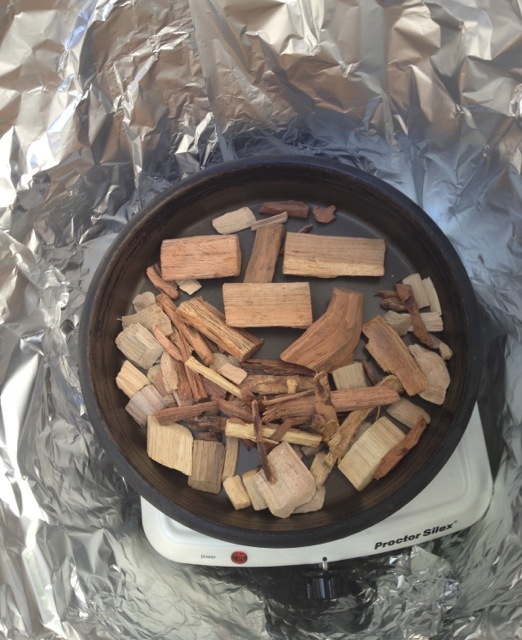 The Wood Chunks worked (sort of) like smokeless incense, while the smaller Chips seemed to smoke better. If you want more constant smoke, try adding Ceramic Charcoal and replenish wet Wood Chunks every hour or so, as needed. Here is next day “Autopsy” photo of inside of Smoker. After 11 hours of smoking, Wood Chunks are still intact. Looks like they’d be good to go for another 10 hours. We do not recommend using them again, as they may have juice residue. – It is easy to use as Slow Cooker, would be very difficult to overcook Meat. At least with our sized Smoker. It you build smaller one with 12″ Grate, your Smoker is likely get much hotter, so you may have to adjust heat accordingly. -The Flavor- This is real deal Wood Smoking technique. Food came out tasting great. If you don’t like the flavor of coal, it is even better the the Giant Egg, which uses Charcoal. – Cost: The $77.38 is less than you would spend for one Smoked HoneyBaked Ham. Smoke two DIY Hams and you have already saved money. – The Lid can get a bit hot, awkward and heavy (our Pot weighs over 25 lbs). There are no handles so use Oven Mitts to pick up Lid. Be careful to clear it above the Meat, as to not knock it away. 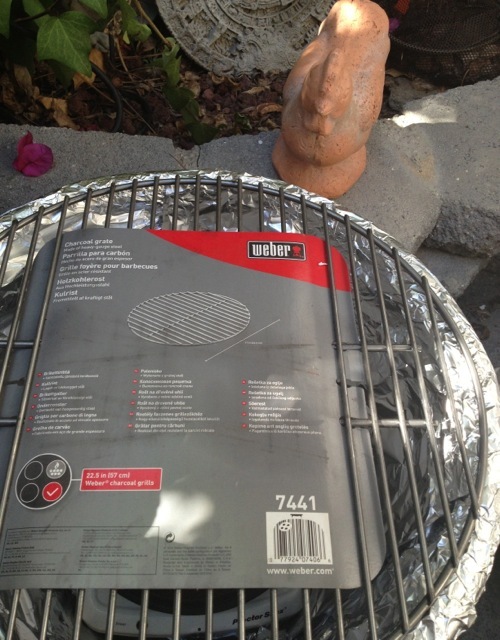 Once again, if you build a smaller 12″ Grate model, Lid should be lighter to handle. Once you get Recipes (and curiosity) down, You can do no-peek cooking for hours at a time. – Smoker is for Low and Slow BBQ Only. Not for Grilling. One advantage of the Giant Egg is that it cooks at extreme heats as well as low temps. This Ceramic Smoker cannot replace your regular Grill for quick fire Hamburgers and Steaks. It would be next to useless if you are into Vegan Cuisine, which almost always calls for quick Grilling Recipes. (though we may experiment with Smoked Kale Chips). This Smoker is best for Chicken Pieces, Sausages, Roasts and Whole Bird Cooking. It could also used to smoke Fish. Meat Thermometer does double duty to make sure your Roast reaches proper temperature. Though Pork is technically done at 160 degrees, you want your Roast well done to at least 175 or more. Then Fats will break down and give up the goods. -Emphasis on Slow. Our 5 lb. Pork Roast took 11 Hours to get well done (and probably could have gone for 3 more). We could normally Smoke a Pork Roast in 4-5 Hours on a regular Charcoal Grill. While experimenting with Smoker, give yourself extra time to be sure your Meat gets fully done. Make alternate back-up plans if you are on deadline for dinner. You can always transfer Meats to finish in oven. Even an hour on the Smoker will impart Natural Wood Flavors that you can’t get from Oven cooking alone, or from Liquid Smoke. 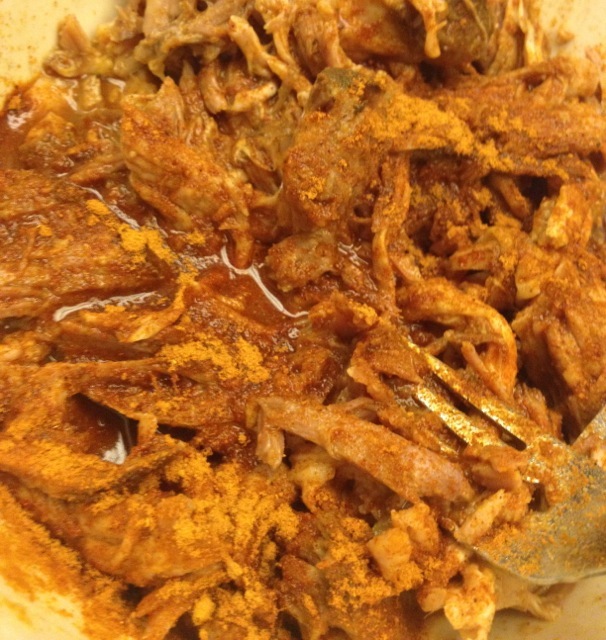 Tender and juicy, Citrus Pulled Pork. The smoky aroma is impossible to describe. Remember how Emeril always wanted to create “Smell-a-vision”. TasteeBQ wants to do something similar for the Internet. Maybe he will invent #WebAroma or #WhatTheSmell? so you will be able experience these smells next time. If you have shopped lately for fresh Ribs, we don’t have to tell you how expensive they can get. Especially if you are feeding a large crowd. Serving Pulled Pork is an affordable alternative. One 5 lb. Roast will render enough meat for about 10- 12 sandwiches. If you are only serving a few (and can afford Ribs) you can also use Smoker to cook them. We will do Rib Recipe soon. 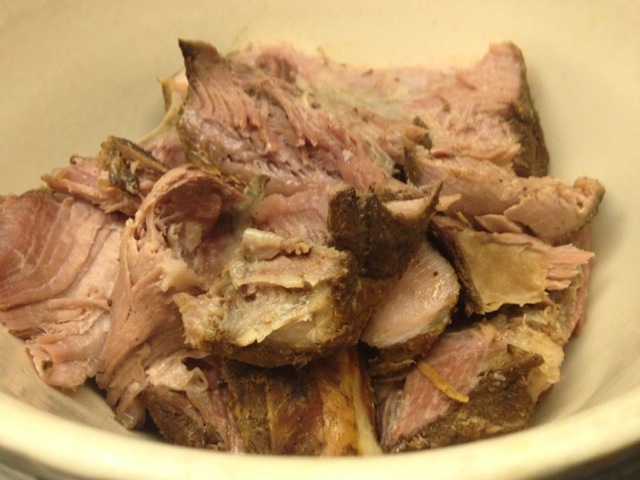 Many Pork Roast Recipes call for the traditional Salt and Sugar Brine. Our Brine uses Orange Juice, which contains enough natural Sugar and Acids to do the Job. Extra Sodium is in the Gluten Free Italian Dressing and Worcestershire Sauce. You can also try this with Apple Juice, Cider and Cloves for the Holidays. Or an Orange Juice/ Lemonade Combo might be nice. Place Pork Roast in resealable Bag, with enough Orange Juice Brine to cover. Keep Bag upright and sealed tight in the Refrigerator. 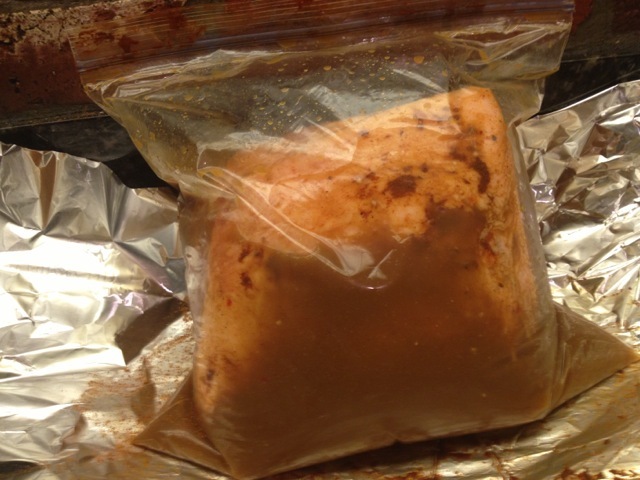 In Large Ziplock, cover Pork Roast with Orange Juice, Italian Dressing, BBQ Rub, Worcestershire Sauce and Salt and Pepper. Shake Well and Refrigerate overnight. May place on Foil or in Bowl in case of leaking. Note Roast is placed on side to avoid dripping into Pan. We leave bottom unlined so it can absorb smoke for first hour (or so) before juices start to flow. Next Day- no need to rinse off Brine. Shake off extra liquid and move Roast to Smoker Place Meat on the Grate to the side, to reduce juice dripping into Wood Chips. 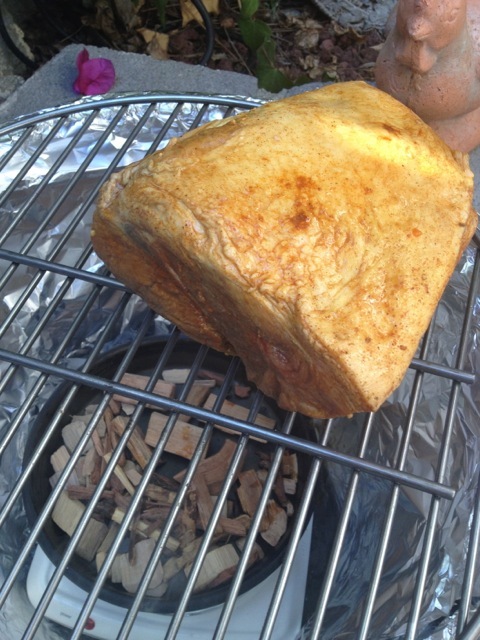 After 1 to 1-1/2 hours place Foil underneath, leaving Meat open to absorb more smoke. Roast at 4 hours, juice being released. 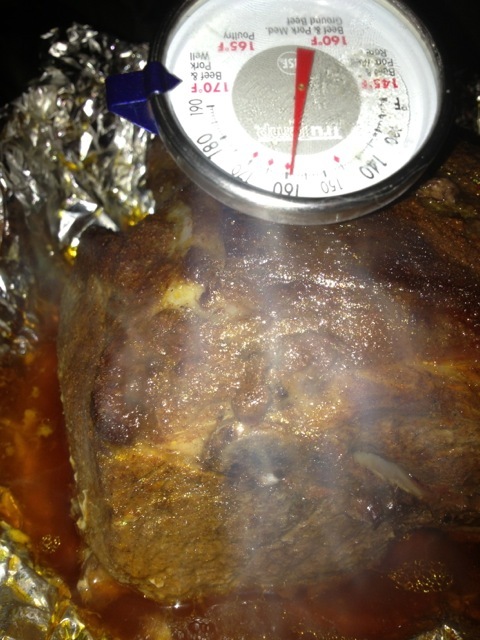 After 4 hours, wrap Roast completely in Foil to get it to heat up inside, and catch the oncoming flow of juices. 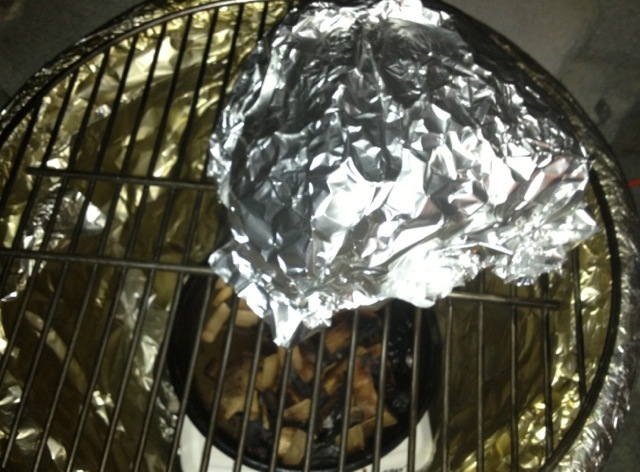 Completely wrap in Foil during last few hours of cooking, to maintain heat. Smoke will still get in. 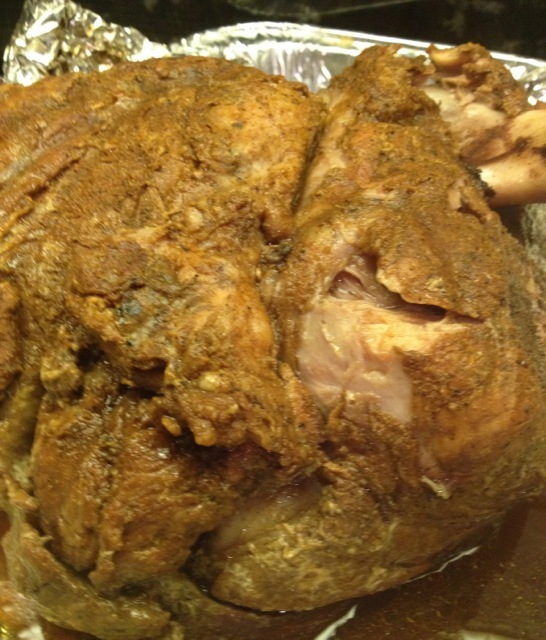 Ours Pork Picnic Roast took 11 hours to get done, you may smoke yours for up to 14 hours. Once done, allow Roast to rest for about and hour. Then pull away! Super simple Gluten Free BBQ Sauce Recipe. You will have plenty of time to make this simple BBQ Sauce. Heat 1 cup of Orange Juice, mixing in 2 Tbsp. POWER BBQ Rub and 1 Tbsp. Apple Cider Vinegar. 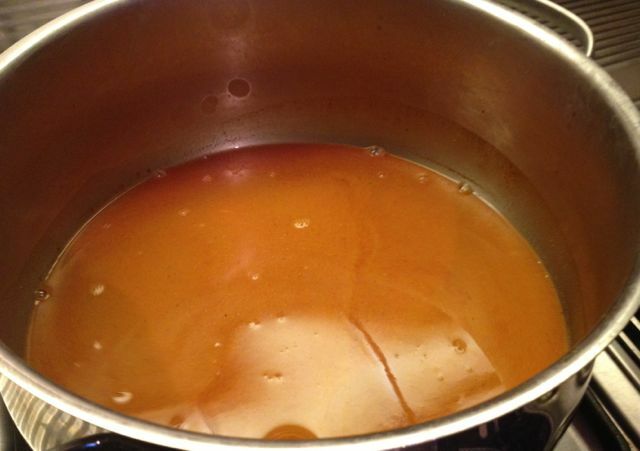 Once it boils, reduce to simmer and (you may) add Raw Sugar or Molasses. Stir frequently. Sauce will thicken as it simmers. It will be ready to use in about 15-20 minutes. First break Pork into chunks. Then use 2 Forks, to shred it to desired consistency. Once Pork is done let it rest for about an hour. Pull Meat off bone and separate into chunks. 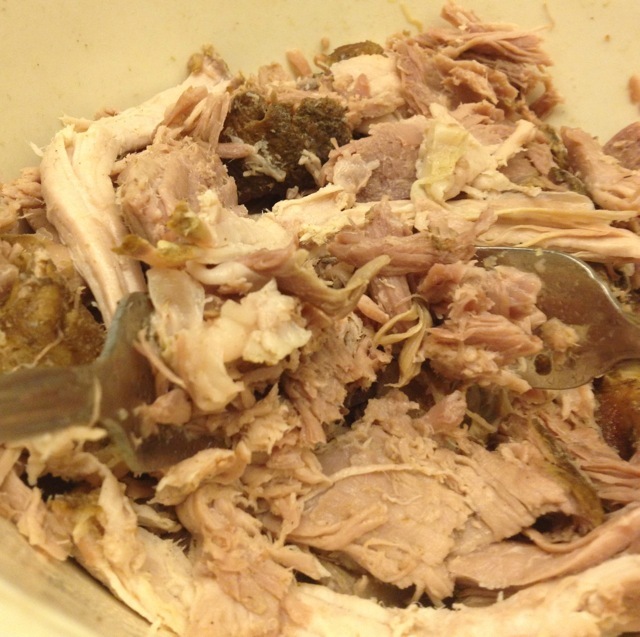 Use 2 Forks to shred Pork to desired consistency. Add BBQ Sauce to drench (not drown) Pork. Add a little more BBQ Rub, as well. Stir and let Meat absorb sauce for a least a few minutes. Serve on your favorite Grilled Bread Roll with Coleslaw & Chips. 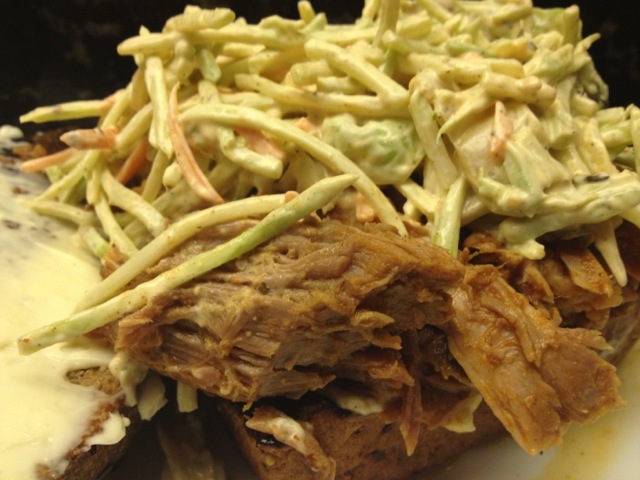 Grilled Cabbage Broccoli Coleslaw is the perfect companion for your Smoked Pulled Pork. Place Cabbage directly on Grill. Has enough moisture, no need to marinate. Chop afterwards for Coleslaw. 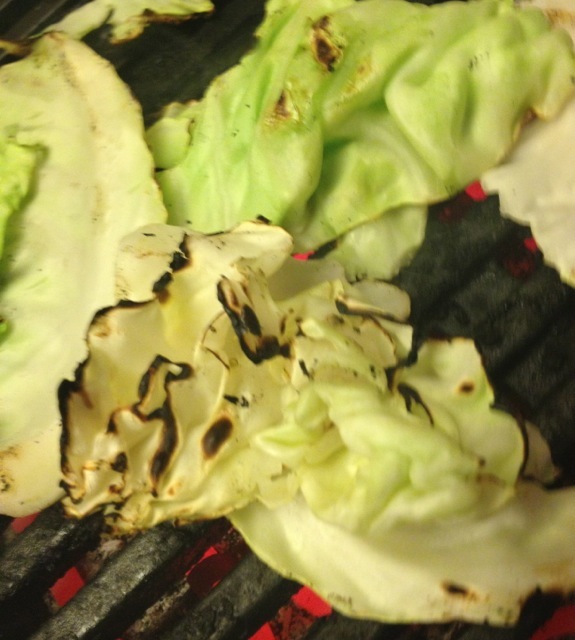 We grilled 1 Cup of sliced Yellow Cabbage. You can put it on Smoker to wilt for 30 Mins. Julienne Cabbage and add to Broccoli Coleslaw Mix with Mayo, Cider, BBQ Rub and salt and Pepper to Taste. Refrigerate for up to 1/2 hour before serving. 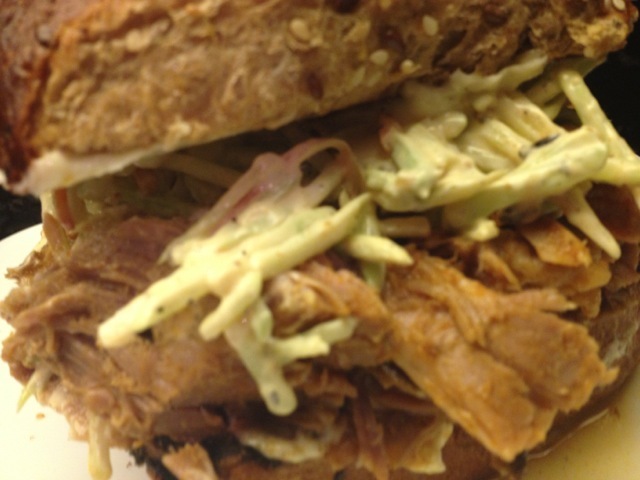 We topped our Pulled Pork Sandwich with Slaw. Delightful. BBQ Catering in Los Angeles at Tastee BQ Grilling Co. Awesome idea! Was it hard to get the top pot off when it was still hot? Hi Jodi. Thanks for comment. Actually Temp doesn’t get much higher than 200-250 Degrees so it isn’t that hot. We used oven mitts. We could have gone with smaller Pots, our weighed over 25 lbs. I’m totally going to try this. It would make a really fun homeschool experiment. Thanks for the idea! That’s great. Please send us a pic of your Smoker and the Smoked Food.You will be amazed by the taste of fresh wood smoking. Wow! Here’s a pretty cool and gluten-free idea for the Labor Day Weekend. Or you can always stop in and see us at BnD’z! Nice. Thanks for sharing. Will definitely have to try your Q next time on East Coast. Have a great Labor Day. Sounds great. Am planning trip to New York this time next year. May have book side trip. Hi CJ- Thanks for sharing. Let us know how it goes with your DIY Smoker. This new article is getting a lot of attention online. A way to save over $900 and make Championship Style BBQ at home. Hi Everyone. Please see 9/9/13 Update on FDA guidelines. Looks like this might have to go back to the drawing board.